The FabriGear MkII cuts a large range of mill-length tube and pipe, whether round, square, rectangular, or triangular. In addition, it can completely process I and H-beams, C-channel, angle iron, and additional user-defined shapes. 6-axis laser cutting means you can cut at any desired angle for weld prep, plus achieve the highest accuracy for easy fit-up of assemblies – all in a single program cycle. Program-controlled loading, workholding, and unloading make it an efficient fabrication cell requiring minimal labor input for small to large volume part production. SpaceGear MkII is an affordable all-in-one laser center. Use its triple-mode, 6-axis capabilities to expand your shop’s horizons and raise yourself above the competition. 2-D mode is for flat sheet and plate up to .87″ thick. 3-D mode makes use of our compact cutting head with ±360° rotation in the A-axis and ±135° in the B-axis to maintain a normal cutting angle to all preformed sculptured surfaces. A non-contact profiler maintains a constant stand-off distance and eliminates marring of the part. Tubes, pipes, and structural shapes can all be processed by adding a CNC rotary chuck and supports for long workpieces. In all, six axes of CNC control allow you to cut weld preps, angled features, and much more in a single setup. SpaceGear U44 is a compact and affordable all-in-one 2D/3D laser center for maximum flexibility. Use its triple-mode, 6-axis capabilities to expand your shop’s horizons and raise yourself above the competition. 2-D mode is for flat sheet and plate cutting up to 49″ square and a full .87″ thickness using our most powerful laser resonator. Slice through steel, stainless, and aluminum more productively than ever. 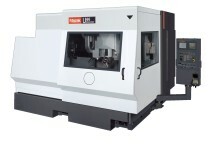 3-D mode brings into play Mazak’s compact cutting head with ±360º A-axis and ±135º B-axis CNC rotary motions to quickly cut, pierce, and trim sculptured parts. Process tubes, pipes, and structural shapes by adding a CNC rotary axis and long material loader. SpaceGear-U44 does much more than a 2D laser with rotary axis because of the added A- and B-axes angular capability.